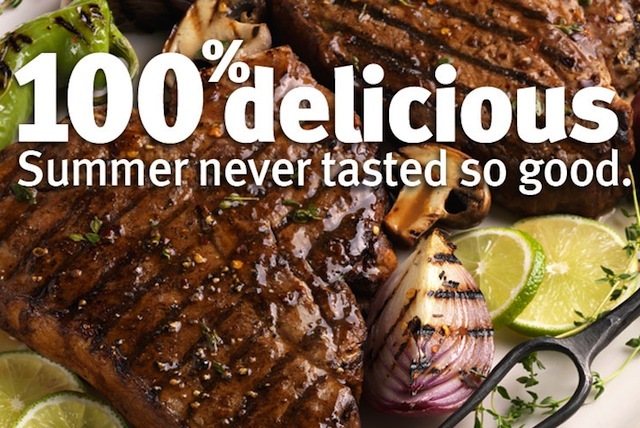 Tyson Fresh Meats’ Star Ranch Angus beef brand is kicking off the summer grilling season with a “100% Delicious” promotion that runs June-August. It is the second promotion of 2015 centered on the brand’s 100% commitment to retail customers and consumers. Tyson Fresh Meats is a subsidiary of Tyson Foods Inc. The “100% Delicious” promotion includes several point-of-sale elements, such as an ironman sign with hardware, store front window cling, shelf billboard, coupons with holder, digital elements and promotional hats for the meat department staff. Additionally, Tyson Fresh Meats is offering participating retailers a chance to receive a $50 gift card by showing off their in-store point-of-sale display. Participants can submit photos of their Star Ranch Angus beef “100% Delicious” promotion display, along with their store’s name and mailing address to [email protected] to receive a gift card (one card per store, per promotion). For more information on the “100% Delicious” promotion, visit StarRanchAngus.com. For business-to-business information on the Star Ranch Angus branded beef program, visit b2b.starranchangus.com. Tyson Foods, headquartered in Springdale, Arkansas, is one of the world’s largest producers of chicken, beef, pork and prepared foods. Its brands include Tyson, Jimmy Dean, Hillshire Farm, Sara Lee frozen bakery, Ball Park, Wright, Aidells and State Fair.